Make the pastry In a food processor, pulse the 2 cups of flour and the salt to combine. Add the butter and pulse until the mixture resembles coarse meal. In a small bowl, whisk the egg and ice water; drizzle into the food processor and pulse just until a rough dough forms. Scrape onto a lightly floured work surface, gather up any crumbs and knead gently just until the dough comes together. Pat into 2 equal disks, wrap in plastic and refrigerate until firm, about 1 hour. On a lightly floured surface, using a lightly floured rolling pin, roll out 1 piece of dough to a 14-inch square, about 1/8 inch thick. Using a knife, cut out three 7-inch rounds. Ease each round into a 4-inch tart pan with a removable bottom, then trim the overhang and prick the dough all over with a fork. Repeat with the remaining piece of dough. Freeze until firm, about 15 minutes. Preheat the oven to 375°. 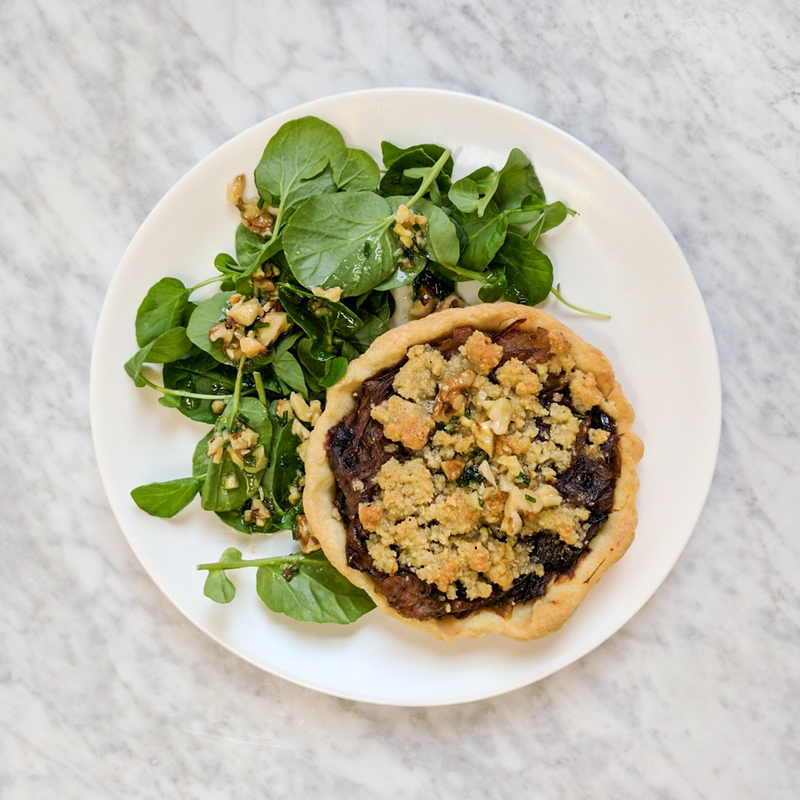 Arrange the tart shells on a large rimmed baking sheet. Line the shells with parchment paper and fill with pie weights or dried beans. Bake for about 20 minutes, until the edges are lightly golden. Remove the paper and weights and let cool to warm, about 30 minutes. Meanwhile, make the filling In a large skillet, melt the butter. Add the onions and shallots and cook over moderate heat, stirring occasionally, until softened and golden brown, 35 to 40 minutes. Stir in the thyme and brown sugar and season with salt and pepper. Let cool. In a food processor, pulse the panko, cheese and pine nuts until coarsely ground. Drizzle in the olive oil and pulse to form fine crumbs. Transfer the mixture to a small skillet and toast over moderate heat, stirring frequently, until golden, about 4 minutes. Spoon the onion-shallot mixture into the tart shells. Sprinkle the tops with 2 tablespoons of the toasted crumbs. Bake until the edges of the pastry are golden and the crumbs are deep golden, about 20 minutes. Let cool on a rack for 10 minutes, then unmold the tarts and let cool to warm, about 10 minutes. Serve. The onion tarts can be refrigerated overnight. Reheat in a low oven to serve. Review Body: When there is roasted onion involved, it's a no brainer!